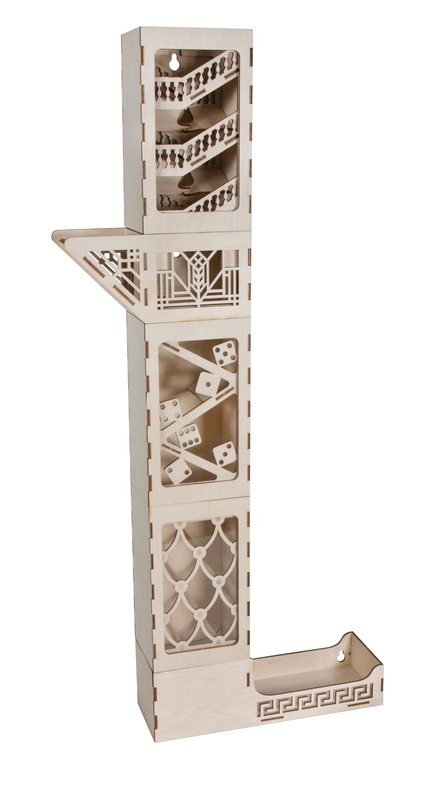 The Broken Token will begin shipping this week a series of modular dice tower kits, each with a unique thematic design, including stairs, bones, pachinko, and others. 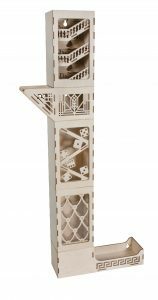 The modules can be mixed and matched for a single dice tower up to several feet high. One module even has a dice-shaming cage, so poor performing dice will have to watch their fellows tumble by. On the backside, each module has a cutout for wall-mounting. And two bases are available, one standard in which the dice roll to the front when the tower is on a table, and one side-mounted so it doesn’t stick out when hanging on the wall. Prices for the individual kits range from $10-22. The Broken Token currently lists five tumbling sections for sale. Others will be listed soon, including a clockwork section with moving gears.